The laser tattoo removal industry is booming! Not only is this service increasing in popularity, but fully removing a tattoo requires several treatments and the price tag isn’t cheap. The average tattoo removal client roughly spends $1,400 per tattoo. After all, skin can only handle so much time with a laser! This means that you will be able to build a long list of clients without feeling overwhelmed. 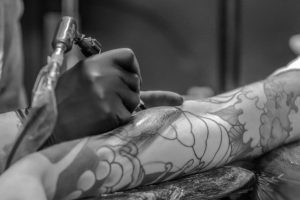 Although tattoo removal is a niche career, there are a plethora of businesses that offer this service. After you complete your tattoo removal training, you are qualified to work in laser clinics, medical spas, tattoo shops, or even open your own business. Pulses from a high-intensity laser are used to break up the ink in your skin without damaging it. Unlike previous tattoo removal methods, the body absorbs the pieces of pigment. There are a variety of different lasers and techniques that a laser removal technician can use, but you have to take into consideration the size, coloring, and placement of the tattoo as well as skin type and age. There are also different types of tattoos: amateur, professional, cosmetic, medicinal, and traumatic. Each type will require a different laser and a differing amount of sessions. To provide a safe and professional service to your clients, you need to gain real skills. Be sure that the tattoo removal training course you choose offers the opportunity to learn on real people. The more certain you are in your ability, the more benefits you will get out of your new career path. For many people, committing to long-term courses and school schedules isn’t an option. If you want a new career path but have children, work full-time, or want to avoid going into more debt, then you should consider tattoo removal training! There are a variety of institutions and organizations offering different courses spanning from four days to just a couple of weeks. This means that you could be certified and working in the tattoo removal industry within a few short months! The costs for tattoo removal training vary but are still much lower than college and university tuition, so you can avoid committing to long-term payments. You can also go back for additional training which will allow you to continue moving up in the industry and offering more and more treatment options to your clients. There is so much potential!